Now that you've found the RGB value of your favorite color and chosen a Google Web Font, you're all set to start building your social media menu! I'm going to show you how to build this social media menu in Mozilla Thimble, a free, web-based HTML & CSS editor. 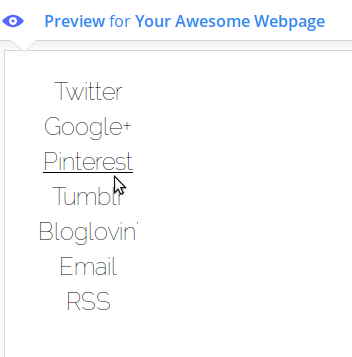 Thimble is awesome because it gives you a live preview of your project as you type in the HTML and CSS. And, it gives you hints to help you catch and prevent errors, so it's helpful for beginners. To use Thimble, go to thimble.webmaker.org and press the "Start from Scratch" button. On the next page, you'll see that the screen is split in half, with an Editor pane on the left and a Preview pane on the right. Delete the "<p>Make something amazing with the web</p>" paragraph and get ready to start writing the HTML for your social media menu! 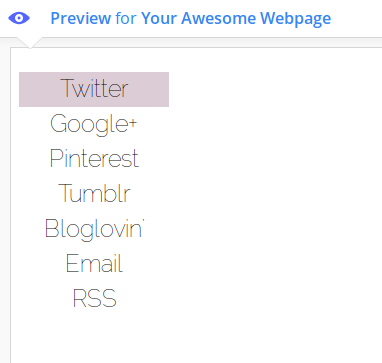 We're going to make an unordered list out of your social media links. Each list item within this unordered list is a link wrapped in <li> tags. LI stands for "List Item". See the class "twitter-soc"? Later when you add the CSS, you'll give the Twitter link its own unique background color by referencing the twitter-soc class. The <a href="http://www.twitter.com/codeitpretty">Twitter</a> segment of the list item is a link to Twitter. The word "Twitter" between the angle brackets is the clickable link to Twitter. Not exactly glamorous, I know. That's what CSS is for! 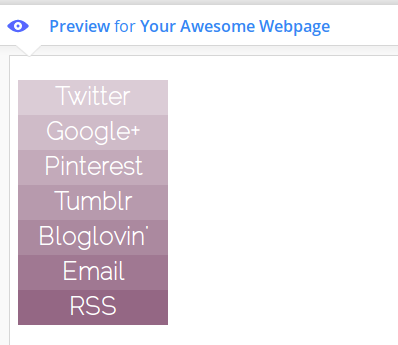 All of the CSS that follows goes in-between those style tags. While we're at it, let's set a :focus style for your readers who use keyboard navigation. This styling will outline and underline your links when they're targeted with the tab key on your reader's keyboard. After you've added those two CSS rules, hover your cursor over one of the links and you'll see the underline reappear. Move your cursor away and it disappears again. OK, we've got the rough outline of a social media menu, but there's no ombre effect yet! Here's where your RGB color and your individual classes for each list item come into play. 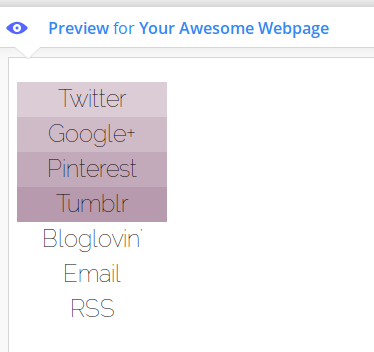 To create the ombre effect, we're going to set the background color for each of the social media links. Let's start at the top. 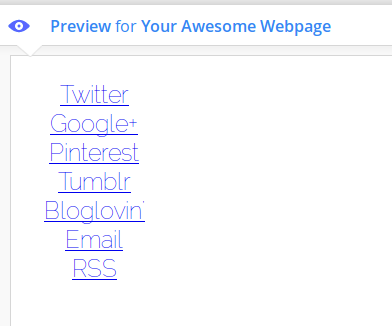 My first link goes to Twitter, so here's how I'd style that link. Replace .twitter-soc with the class you set for your first social media link, and replace the first three numbers in the parentheses after rgba with your chosen color's rgb value. I used the rgb value for my favorite shade of purple and set the last number to .3, for 30% opacity, but you can start lower or higher if you'd like. Opacity ranges from .1 (10% opacity) to 1 (100% opacity), so use that range as a guide for determining where to start. Now that you've filled in the background for all of the links, you can change the text color to something else if you'd like. To do that, go back to the .ombre-social-media a styling and change the color: rule to another color. I went with white. Then, copy and paste all of the CSS (everything between the <style></style> tags) into the template designer by going to Template > Customize > Advanced > Add CSS. 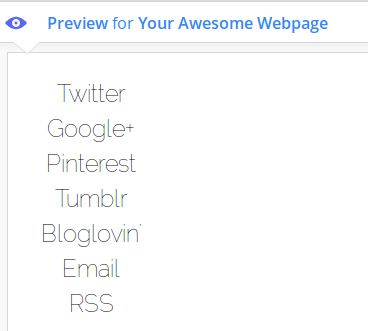 Press the "apply to blog" button to apply your styling to the menu. You should see the styled menu appear in the preview screen below. Then, copy and paste all of the CSS (everything between the <style></style> tags). If you're using a child theme for your blog, add the CSS to your child theme's style.css file. 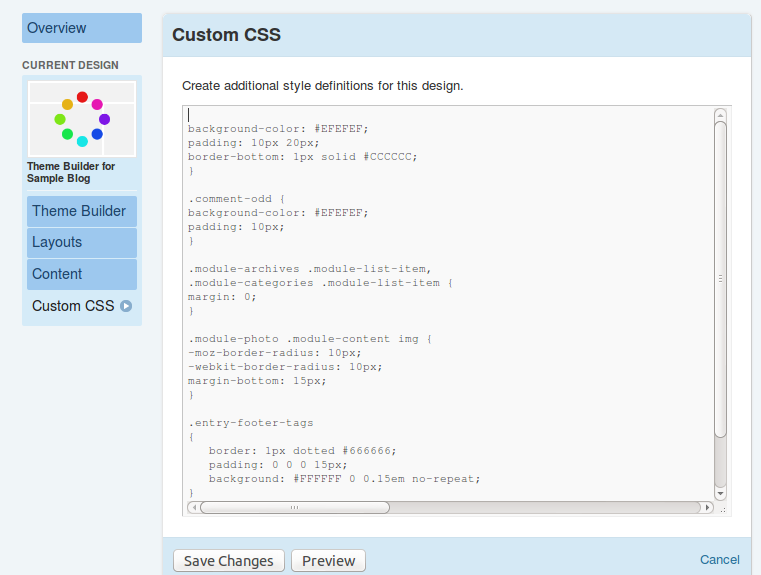 If you're not using a child theme, you can use Jetpack's "Custom CSS" feature to add the CSS to your blog. Go to Content > Widgets > Embed Your Own HTML and press "add this module". Copy and paste the HTML portion of your social media menu (everything between the <body> </body> tags) into the new HTML module. Then, copy and paste all of the CSS (everything between the <style></style> tags) into your Custom CSS field by going to Blogs > Design > Custom CSS. Press "Preview" to preview the changes, then press "Save Changes" to apply them to your live blog.